Hall of the Mountain King: Review: Various Artists, "We Wish You a Metal Xmas"
Review: Various Artists, "We Wish You a Metal Xmas"
Christmas seems to come earlier and earlier every year. I've been seeing decorations in the stores since, it seems, the end of August, and I've had my tickets to see Trans-Siberian Orchestra in December in hand for nearly two months. Still, with Halloween not even having arrived yet and it being at least a month earlier than my TSO CD's normally find their way into my truck, it was a bit tough to get into the spirit. Then the first Christmas record of the season, Armoury Records' "We Wish You a Metal Christmas and a Headbanging New Year" arrives on my desk, and despite my misgivings about the early timing, I can't resist the list of participants. What we have here is a collection of metal renditions of Christmas songs both classic and campy with a lineup that features some legends of the genre. The compilation was put together by Wendy Dio, wife of legendary metal singer Ronnie James Dio, and features performances by Lemmy Kilmister, Billy Gibbons, Alice Cooper, John 5, Billy Sheehan, Tony Iommi, Rudy Sarzo, Geoff Tate, Doug Pinnick, George Lynch, Tim Owens, Steve Morse, Vinny Appice, Chuck Billy, Scott Ian and many others. Oddly, Wendy Dio says her husband was one of the toughest stars to convince because "he doesn't sing Christmas songs." The performances here are remarkably good, beginning with the second track, a rowdy version of "Run Rudolph Run" featuring perhaps one of the strangest pairings here in Motorhead's Lemmy Kilmister, ZZ Top's Billy Gibbons and the Foo Fighters' Dave Grohl on drums. A similar turn comes on the excellent version of "Santa Claus is Back in Town," where ex-Judas Priest and Iced Earth vocalist Tim Owens teams up with Steve Morse to show a rawer hard rock vocal that we haven't heard from him before. Some play it straight, some put their own spin on it. Alice Cooper is most notable among the latter with his Christmas horror tale "Santa Claws is Coming to Town." In his hands, it transforms from an innocent children's song into something more than a bit disturbing. Dio and Iommi essentially turn "God Rest Ye Merry Gentlemen" into a fairly dark Sabbath number. They're not all as strong as those two, though. Geoff Tate turns "Silver Bells" into a hard rocker, which might have worked, but his normally impressive voice sounds really, really bad here. Of the songs that stick with the script, so to speak, one of the strongest is the grooving version of "Little Drummer Boy" featuring King's X vocalist Doug Pinnick, George Lynch, Billy Sheehan and Simon Phillips. Phillips throws a little groove on the beat, and Pinnick's vocals are just perfect. It's easily one of the strongest offerings here. There are a couple of head scratchers as well. "Silent Night" featuring Chuck Billy of Testament, Scott Ian of Anthrax and John Tempesta of Exodus, Testament and White Zombie sounds like a train wreck on paper, but the death metal take is, in truth, kind of interesting in an odd way. The strangest choice here, though, has to be "Grandma Got Run Over by a Reindeer" featuring Stephen Pearcy of Ratt and Tracii Guns. Yeah, it's pretty much as bad as it sounds. Of the other tunes on the album, none are bad but none stand out as much as the previously mentioned ones. Joe Lynn Turner's take on "Rockin' Around the Christmas Tree" is lively and energetic, and "Deck the Halls," featuring Oni Logan is enjoyable. Aside from "Grandma Got Run Over by a Reindeer" and the off-kilter "Silver Bells," the only other miss is Tommy Shaw and Steve Lukather's take on "Happy Xmas (War is Over)," which is more or less note for note and a bit bland. It's a bit of surprise, but this is actually a really, really good record. I'd recommend it for any classic metal fan looking for a little Christmas cheer early in the holiday season. 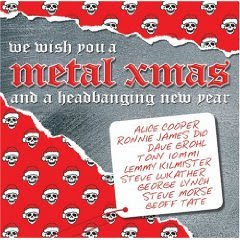 Get "We Wish You a Metal Xmas."